Asymmetric shape for an exceptional strength to weight ratio. Keylock System for (snag-free body / gate interface). 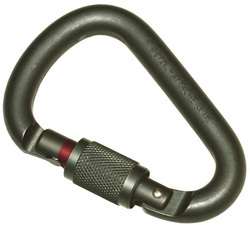 When loaded, the carabiner is oriented in the optimal working axis. EndoFrame construction guarantees excellent weight distribution for optimal comfort. Waistbelt and leg loops with doubled straps. Waistbelt wider on the sides? Adjustable leg loops allow the harness to be donned while wearing mountaineering or ski boots, or to easily adjust the size for different clothing. Dyneema tie-in points for excellent resistance to rope friction?